The new game from D3 Publisher and Witchcraft. The latest issue of Weekly Famitsu has first details on Idol Death Game TV, the newly announced PS Vita game from D3 Publisher and Witchcraft. The game centers around an unscripted event called “Dream of Dreams,” set within a desolate old mansion, where a center idol is to be decided from the members of a popular idol group called “Project 47,” including the year’s low ranking members. Within Project 47 are units, such as “Team Happy” and “Team Smile,” and in total the group has over 200 members. The player will choose to play as one idol from those appearing, and the story will change accordingly. There are exploration, judging, and “Death Concert” elements. During exploration, you’ll look for items throughout each stage as well as exchange information with idols. And it seems that it’s important to both raise your own spirits while lowering those of your opponents. During judging parts, you’ll be judged on your dancing and performance. And during “Death Concerts,” the idols that didn’t make it through to the final judging are killed. However, it seems that by clearing the trials of Doripaku (voiced by Kappi Yamaguchi), a costumed character with pink hair who leads the event (and while cruel supposedly values human life), the defeated can somehow be revived. Mariko Kamata (voiced by Azumi Asakura) – Rank 88. A comforting idol part of the first graduating class who has a 10-year career. Chiharu Chigasaki (voiced by Emi Uema) – Rank 5. An orthodox idol who puts in great effort. Shirase Tsubaka (voiced by Yurika Kubo) – Rank 15. A mood maker and younger sister-type idol who adores Mariko and Chiharu. Ayaka Tennouji (voiced by Yu Serizawa) – Rank 6. The leader of Team Smile and a woman with a strong sense of justice. Rito Karasuma (voiced by Asuka Nishi) – Rank 43. An air-headed idol talented in acting who admires Ayaka. Development on the game is currently 69 percent complete (hehe). It features illustrations by Metawo Ueda, script and supervision by Shoujiro Endo, and is produced by Yujiro Usuda. 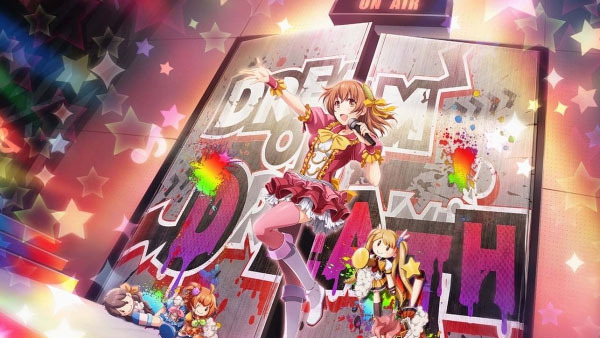 Idol Death Game TV will launch for PS Vita in Japan on October 20.